When the U.S. Postal Service issued a document last month that outlined a plan to offer financial services at its more than 35,000 branches, the banking industry reacted with a collective guffaw. Too big and slow; won’t work; people don’t trust the Post Office, was all over Twitter for the next couple of weeks. The skeptics do have a point: A recent survey showed that about 75 percent of Americans were not interested in using financial services from the Post Office. On the other hand, only 26 percent of Americans have confidence in U.S. banks, according to a Gallup poll cited in the Post Office document. Which side is right? Perhaps ironically, it was my current visit to Toronto that showed why there’s plenty of room for the USPS’ plan to be a success. To banks in Canada, the issue of how to serve remote towns is a HUGE deal. To be clear, “remote” in Canada means nothing like “remote” in most parts of the United States – we’re talking towns that are 50, 100, 200 miles removed from the rest of civilization. Banking may not be quite the life-and-death matter as, say, hospital care, but if something isn’t available in town, getting to it is no joke. On the other hand, there’s a certain minimum number of customers needed to support a bank branch – popular opinions seem to start at 1,000-2,000 just to break even – and that number is steadily increasing as customers can do more of their banking online. In other words, in a town of 1,000 people or less, a full-service bank branch simply may not be viable, so small towns often find themselves caught in the middle. In recent years, many small towns in the U.S. have felt the squeeze as their only bank branches have closed, leaving locals with scant options. While you won’t find many U.S. towns (outside of Alaska) that are 50 miles away from a bank, even a 10- or 15-mile drive makes it a significant undertaking. That’s where the Post Office comes in. U.S. Census data lists 9,283 cities with a population of 1,000 or fewer, and almost 13,000 in total that contain less than 2,500 residents. That’s somewhere between 10 and 30 million people who likely have limited or no access to nearby banking services, and for whom a local bank branch or quasi-branch would fill a legitimate need. 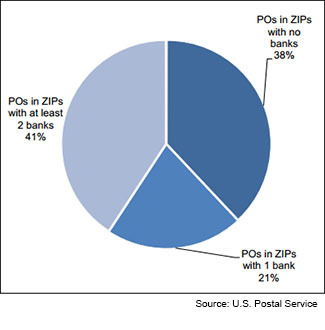 The USPS alludes to this on Page 6 of its report, noting that most of its offices are in “bank deserts” with either one or zero bank branches in the same ZIP code. Fully 38% of post offices – that’s more than 13,000 branches – have no banks nearby. In these “bank deserts,” particularly when they occur in rural areas, the Post Office would have a huge advantage, in that it would be unprofitable for a bank to open a branch there, but if a post office already exists there anyway, the cost of adding financial services is marginal. I have to admit, at first glance, I met the USPS’ stated goal of “providing non-bank financial services for the underserved” with a yawn: Just one more vendor trying to crowd into the “unbanked” market – and how did a huge government agency think it could compete with dozens of similar projects from banks, card companies and high-tech startups aiming to go after the same market? As it turns out, for a significant segment of the population, the Post Office may be solving the same problem in a simpler way. While the banks and Silicon Valley are trying to invent a way around the need for real-world infrastructure, the USPS is aiming to reach the same end by using infrastructure that already exists.